Loyalty programs have existed for many years and started with the paper based programs whereby loyalty was managed on a one to one basis. The advent of email changed the dynamics and created a much more efficient and cost effective communication and now the use of mobile has added a vital element of immediacy. The use of SMS and MMS allows you to notify the consumer of an offer directly to their phone inbox; and we know that 98% of people read their text messages immediately. 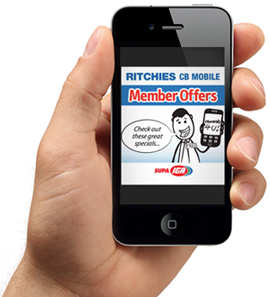 Messages can be customised, and can contain anything from plain text to animations, videos or coupons. One client featured recipes using this week's specials! The possibilities are limited only by your imagination. The mobile also offers you a way of linking the message to an on device application or a web based application run thru the phone's browser. Whether you are looking to start a loyalty program, or to add a mobile component to an existing program, Thirdscreen has a wealth of experience via customers like IGA, Jeans West and Campbells wholesale to support you through the design, development and rollout of your program. For complex programs, our development team has a wealth of experience to ensure that your particular needs are met. Thirdscreen's unique combined MMS and SMS loyalty platform means that, where a consumer cannot receive MMS, they will receive an SMS containing the same offer automatically.